Yemen’s leader blames Israel and the US for rebellions. Qaddafi points fingers at the US and adds al-Qaeda and spiked Nescafe to his black list. Yemen’s U.S.-backed president is blaming Israel and the United States for the uprisings in the Middle East while Muammar Qaddafi points fingers at the American government and al-Qaeda. "There is an operations room in Tel Aviv, run by the White House, with the aim of destabilizing the Arab world," Yemeni President Ali Abdullah Saleh declared Tuesday during a speech at Sana'a University. "The wave of political unrest sweeping across the Arab world is a conspiracy that serves Israel and the Zionists," he added. Saleh, a key American ally in its war against al-Qaeda and Taliban terrorism, did not spare the United States from his fury as he tries to hang on to power in the face of massive protests and police violence that have left two dozen dead. "Every day we hear a statement from [U.S. President Barack] Obama saying, 'Egypt you can't do this, Tunisia don't do that,'" Saleh told students and professors at the university. "What do you have to do with Egypt? Or with Oman? Are you president of the United States or president of the world?" Not to be outdone, Qaddafi blamed the Libyan rebellion on the United States, and former prisoners at Guantanamo Bay, whom he said actually are members of al-Qaeda terrorist cells. As his dwindling number of army supporters maintain their hold on Tripoli and battle rebels for re-controlling eastern towns, the eccentric Libyan dictator said his opponents are motivated by al-Qaeda leader Osama bin Laden – and also are influenced by drinking Nescafe that is mixed with hallucinating drugs. In Iran, the government-controlled PRESS TV charged that Israel is providing Qaddafi with mercenaries to kill protesters. 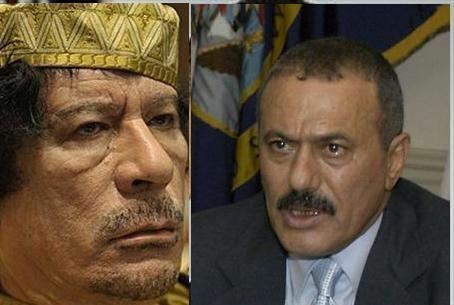 It quoted Egyptian sources as saying that an Israeli firm received permission from Jerusalem to provide the Libyan dictator with 50,000 mercenaries. PRESS TV also claimed that the Israeli company supplying the mercenaries receives $100 for each person it enlists to kill opponents.